This colossal TOME clocks in at 535 pages of content, 1 page front cover, 2 pages editorial/introduction, 1 page advertisement/product checklist, 3 pages of ToC, 2 pages of SRD, 1 page obituaries, 1 page back cover, leaving us with 524 pages of content. Yeah, I know. You expected Northlands Saga first. Well, while I was digging through THAT massive tome, I was asked by several people to cover this monster first. So I listened, put Northlands Saga on the back-burner (its review should hit site early 2017) and instead started devouring this massive tome. So consider seeing this first to be basically me listening to the vox populi. Ahem. Let that page-count sink in. To call this book “enormous” or by any other name than “TOME” in allcaps, does not do it justice. All right, but frankly, there are enough big city sourcebooks that simply weren’t that good. 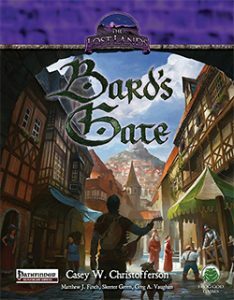 Is Bard’s Gate different? Well, we begin with one component often ignored in city sourcebooks, namely the fact that they do not end at the city’s wall. Thus, bard’s gate, as presented here, does not exist in a vacuum – the valley of the lyre, situated in Frog God Games’ Lost Lands, is where we first turn our gaze upon opening this vast book: Within this context, we are introduced to Bard’s Gate’s suzerainty before getting a recap of technology levels found in the Lost Lands. Beyond the copious amounts of information pertaining unique places and adventuring potential, the book follows the precedence of the Borderland Provinces and the legendary Sword of Air in that it provides a vast array of random encounter tables by area and goes beyond that. In stunning full color, we receive the local map, both as part of the over-arcing region and in a more detailed, iteration – from the valley of shrines and the region first featured in the by now legendary Tom of Abysthor (available for PFRPG in the Stoneheart Valley-book) we move towards the mining operations of the vast metropolis, learn about entrances to the underworld, abandoned villages now held by gnolls and barrows containing unique undead barbarians. Forests that are haunted by undead treants, the fully mapped citadel of griffons (and yes, other citadels have different maps) – there is ample of adventure to be found beyond the confines of the city. This is not supposed to mean that this is a grimdark supplement; quite the contrary. It just means that there is enough for adventurers of all level to do. If you, for example, have been intrigued by the underguild, first featured in “Vampires & Liches” and updated to contemporary systems in “Quests of Doom I”, then you’d be in the right place. It should also be noted that this book, in spite of its copious level of detail, is very much cognizant of recent developments in the game: We can find, for example kinteicists or similar classes among the numerous NPC-builds. Similarly, from masked guilds of assassins to an order of female paladins, plenty of beings with whom to interact. Now, as you may have noted if you’ve been following my reviews for some time, you’ll notice a certain proclivity for details, for politics and intrigue: Well, rest assured that notes on the latter components indeed are provided and should keep groups busy for pretty much any time-frame you wish. More important in an age wherein kingdom building, downtime rules and the like exist, would be the fact that the pdf actually provides property values and taxes by district – including costs of upkeep! I absolutely adore this often-neglected component that no other city sourcebook, at least none I have recently read, covered in this way. Speaking of aspects that made the simulationalist GM in me smile from ear to ear and jump up i my chair: Know how I commented on The Lost Lands in the Borderland Provinces books as a region that felt more plausible, more believable than in pretty much any other setting I had encountered in a while? Well, there was one aspect so far only Midgard got right (though it could have been emphasized more) – in earlier ages, social class was significantly more important than even today. Well, this book acknowledges a great catalyst of both adventuring and roleplaying and provides DETAILED rules for determining social class and wealth: Beyond class, race and ethnicity as determinants, rules for gossip, drops for in- and decreases in social status make for an amazing section, also since starting attitudes are determined by class – so yes, in this book and the Lost Lands in general, there may actually be a good reason to send the rogue to deal with the homeless, the paladin to deal with royalty. This may not sound like much, but I’ve been playing with my own homebrew social class rules and they have been a superb catalyst for roleplaying. But this is a city sourcebook, in spite of the copious coverage of material beyond the city: As such, it should be noted that each and every district of the city can be found within these pages: From the tent city and stable row to the market district, each of the districts not only provides statblocks for local beings and notes on remarkable places alongside detailed maps of the respective environments, we also receive notes on local characteristics. Beyond the glorious full-color artworks of the respective chapters depicting the districts, it ultimately would be the people that populate the city of Bard’s Gate that render it evocative: From strange mages to notorious doppelgangers, the city presents a strange amalgam of mythological resonance and the fantastic established within the canon of the world: From the pied piper myth to the shapeshifting Grandfather; numerous fully mapped temples (including bacchae) , vampire hunters on the run…there are so many fully statted NPCs and hooks within this tome that even attempting to list them all would frankly be an exercise in futility. Just rest assured that, no matter your preferred themes, chances are you’ll find their representation within the pages of this book. More than 20 pages of NPCs, from the general to the specific, are featured in the first of the appendices, only to be followed by exceedingly detailed random encounter charts (including charts to determine attitudes of drunken folks!). New magic items galore as well as the spider domain and its associated spells add further material for those of us craving crunch. Speaking of which: Beggar NPC-class, baby! Oh, and a killer PrC, the disciple of orcus archetye and two racial variants can be found herein: The street dwarf and the wood elf. Both races are well-crafted, though the absence of age, height and weight tables for them constitutes one of the few gripes I could field against this book. Even after all of that, we have barely reached page 387 – so what do we get beyond that? Well, adventures, obviously! And I’m not talking about the usual half-assed back-of-a-setting-book modules…after all, this is Frog God Games we’re talking about. We’re also not talking about 1 module…we’re talking about 7. All right, since to cover these, I need to go into SPOILER-territory, from here on out, I’d ask potential players to jump to the conclusion. 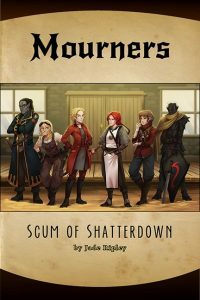 A matter of faith, intended for characters level 3 – 6, puts the PCs on a trail of missing kids from the poorer sections of town, and in the process of the investigation, confronts them with the vast evil of a horrid child-slave-ring that needs to be purged…but how to go about said business? The schism between factions of an otherwise good church can potentially lead to a whole campaign worth of follow-up material. Have I mentioned that Dropsy the clown makes one of the most disturbing villains I’ve seen in a while or the cool gondola chase? “The Over and the Under” would be a change of pace from politics and social issues. Intended for 5th to 7th level PCs, the adventure is basically a heist that is surprisingly well-structured regarding its preparation options; think of this basically as Ocean’s 11 in a fantasy casino. Yes, I liked that…and, if you want to, you can make that also a nice module to send the PCs off to riches beyond belief (read: untimely deaths) in Rappan Athuk. At the same level-range, we receive a cat-and-mouse themed module that centers around retrieving a magic item and sewer/tunnel-crawling as well as rescuing a captured priest of Bast…which coincidentally means that it would also fit pretty much perfectly within the Southlands-context, but that as an aside. A fully-depicted black market basement would be up next (it doubles as basically a mini-module, if you choose to run it as such), before the level 8 Gnoll Fortress follows up on the gnoll raiding party featured in “The Stoneheart Valley” and gives them their proper due: And do NOT believe that these threats will be easy to eliminate: A lot of individuals sport class levels and with ettins etc. included in the mix, dealing with this constant threat to the region is most assuredly a task that will not come easy to the PCs. “Slip-Gallows Abbey”, intended for 10th+ level characters, deals with the exploration of the eponymous place: The result, among other things of the hubris of mortals believing they’d be capable of screwing over the dread entities of the city of brass, it is a highly-lethal dungeon-crawl through the cursed and shadow themed place. Now the maps of this book deserve special mention: Full-color and gorgeous, they come with regular and key-less, player-friendly iterations of both the massive city, its environments, AND the locales featured in the city’s write-up and the modules, providing maximum usefulness to the city and its environments. Editing and formatting are truly impressive for a book of this size – there is neither an accumulation of typos or the like, not an excess of rules/formatting hiccups to be found here. The book is precisely crafted. Layout adheres to a neat 2column full-color standard that manages to cram a metric ton of text upon each page: This book, in a less efficient layout, could have doubled in size. So yeah, there is A LOT in this book. The artworks provided for the tome are gorgeous and full-color…and yes, they are original pieces. While a few are used more than once herein, I am certainly not going to complain in the aesthetics department, particularly considering the HUGE amount of absolutely stunning full-color maps. Speaking of which: While I couldn’t afford backing this massive beast of a book, I do believe that the colossal map of the city in print out to be something to look forward to. I wouldn’t comment on the print copy since I do not have it in the case of any other publisher. However, Frog God Games have, at this point established that their massive hardcovers stand the test of time by virtue of their quality. So yeah…if in doubt, I’d try to go for that version. 3.X was, among many unpleasant things, also the golden age of amazing city source-books: With particularly the scarred lands delivering some of my favorite places ever and with the Iron Kingdoms Great City, Ptolus and Freeport adding to the fray, I still count quite a few of the cities from that age among my favorites. Paizo has equally done an amazing job of crafting evocative, unique settlements since. However…as much as I love Necromancer Games, the original 3.X Bard’s Gate will never be a book I fondly remember. It should have been a milestone and featured the worst editing of the NG-era, felt disparate and confused and lacked a cohesive, unique identity. It is a book I buried deep within the confines of my collection and never looked fondly upon. This obviously meant that I could have been more excited to t review this book. To be quite honest, it is only my faith in Frog God Games that made me give this a go in the first place. After showing with the excellent Borderland Provinces books that the cadre of authors and designers can craft superb sourcebooks, I felt a glimmer of hope for this supposed lynchpin of the Lost Lands, hoped that it would finally bring justice to this massive city. The sheer scope of this book is frankly daunting; the fact that it actually manages to be that lynchpin, however, is what makes it amazing: This is the central puzzle piece around which the other aspects, all the extensive canon, is situated around…and it *FEELS* like it: From the humble small modules to the classics, from the old to the new, Bard’s Gate manages, with almost encyclopedic aplomb, to connect a vast network of narrative threads and weave them into a cohesive whole that doubles as a compelling, meticulously planned city. More importantly, it is now actually a place the PCs will want to protect: There is everything to be found and gained within bard’s gate, everything to be lost as well. It can be a glorious place and a hell-hole at the same time and ultimately feels like an organic, breathing entity of a city you could wander through, managing to bring an attention to detail and a diversity of scopes from the mundane to the epic to the table that makes it a milestone of a city. Bard’s Gate isn’t a weird city, though it features such themes; it is not a grim city, though it can be. It is both decidedly fantastic and down to earth at the same time and manages to convey a sense of historicity you won’t find in most fantastic metropolises. In short: This book’s existence makes the previous iteration of the book as obsolete as humanly possible and doubles as one of the most compelling city sourcebooks I have read for PFRPG. The only other city sourcebook which has, by virtue of page-count, even the remotest chance of standing up to this juggernaut would be Freeport and I don’t have that book since its first PFRPG-foray back in the day disappointed me. In short: Bard’s Gate stands very much as a class of its own, with in particular the acknowledgment of social classes being one of my favorite aspects within. Add to that the great prose, the winking love letters to the community and the creative, challenging modules and we have a book that oozes passion and heart’s blood from every page. It should come as no surprise, then, that I consider this to be one fantastic tome, well worth of 5 stars + seal of approval as well as a candidate for my Top Ten of 2016. As per the writing of this review, this book can only be purchased on Frog God Games’ homepage here! Where are today’s reviews/happy holidays! You may be asking yourselves: Where are today’s reviews? Usually, I crank out some really big ones before the holidays. The short version is: I have a bunch of big ones ALMOST done, but the fallout of the horror-week, where every single day screwed me over, sends still ripples through my usual, careful time-management that pushed some aspects back. As always, the holidays are a busy time IRL and the fact that the 31st is my anniversary with my significant other further complicates this, as does one of my best friends celebrating his birthday on the 27th. To cut a long ramble short: I am trying my hardest to get some of the promised reviews I scheduled originally for this week done before the year’s over, but for the remainder of the year, until ~6th of January, I am frankly not sure how much time I can assign to working on these. You will see reviews, mind you – just not yet sure when, where and how many. January certainly has several damn cool books coming up and my pace will continue to be frantic, considering the big books I managed to complete/almost complete this month. Dear readers, and in particular, dear patreons! It is my most humble wish that these holidays, no matter which belief or lack thereof you subscribe to, provide nothing but joy, serenity and serendipity for you and yours; I hope that those dice roll in your favor; that you’ll spend the holidays in the manner most enjoyable for you and yours. To everyone capable of enjoying these days, I wish, from the bottom of my heart, that you’ll be able to maintain this wondrous feeling of warmth and joy for the days to come! More than that, though, my thoughts go out to all of you who, even in this joyous time, are suffering in one capacity or another. Rest assured that you are NOT alone.No matter how bleak a day may look, no matter how heavy one’s bones may feel in the morning. This is not me just offering compassion – this is my firm conviction that accompanies every single, bad day: There will be better days and as trying as these times may be for some of us, there will be better years ahead. This wheel in the sky will keep turning. As long as one of our dice is still rolling, as long as one screen’s standing and as long as there’s someone, somewhere, filling a char-sheet, we never are truly alone. There will always be people who can relate and not a day goes by where I do not feel privileged for the amazing joy the hobby has provided for me and those whose lives I, hopefully, touched in some positive manner. I certainly know that, from my dear departed friends Joshua Gullion and Steven D. Russell, to the vast amount of amazing people who came together on my behalf this year (you know who you are!) and to those I met…I am blessed to know so many intelligent, amazing folks. The world is a better place for having you all in it, for bearing the trail you leave in this ball of water and dust. So yeah…see you around! Happy whatever-you-are-celebrating-or-not-celebrating! I better use the rest of my concentration to prepare the missing reviews…expect to see some hit site during the holidays. This installment of the Four Horsemen present-series clocks in at 29 pages, 1 page front cover, 1 page SRD, 1/2 a page of editorial, leaving us with 26.5 pages of content, so let’s take a look! 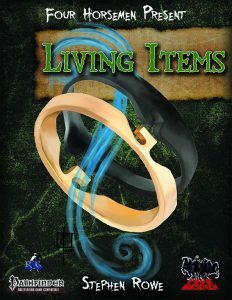 So, what are living items? Well, for one, they are one step beyond intelligent magic items: They are potentially complex personalities beyond the confines of the purpose-driven aspects we usually associate with them; personality-wise, they are ultimately alive as such, they are prone to switching outlooks over the course of their existence. From a roleplaying perspective, the question of identity and its representation becomes particularly intriguing. For balance purposes, living items are treated as constructs, not objects and begin play with a clumsy fly speed of 20 ft., which increases at 4th level and every 3 levels thereafter by +10 ft. and one maneuverability class, culminating in 60 ft. + perfect maneuverability at 16th level. Living items begin play with only mental attributes and as such, concise guidelines for various attribute generation methods are provided. They are always masterwork and don’t get starting gold, but do gain WBL. Each living item, obviously, represents an item given life and thus, you choose an item definition, which collates the item to a respective slot or a category of item to be wielded. Living items heal naturally, but otherwise have the healing restrictions imposed upon constructs, which serves to balance out their impressive array of immunities. Wisdom acts in lieu of Constitution to determine negative hit points. Yeah, realize something? This pretty much opens a vast, colossal can of worms – after all, PFRPG’s engine employs a significant array of values that derivate from the physical abilities…and the pdf goes on to systematically define them: CMB and CMD, initiative, AC, atk, HP – it is pretty hard to picture a more excessive incision into the core character-constituting aspects of the engine…and surprisingly, the living item engine presented here retains its functionality in spite of this significant modification. Living items are either Small or Medium and are capable of speech – so that would be the basic engine. From here on out, we categorize living items by type: Body, Charged, Egoist (usually a ring, amulet, etc. that is too small to work on its own, acting by proxy via hijacking wielders), Protector, Weapon or Wondrous would be the subtypes available and all have different properties – whether you want to play the floating sword or the criminal ring-mastermind that switches from possessed underling to possessed underling, chances are that you’ll find your particular concept represented here. Living items do gain levels akin to regular characters and it is with the class provided that these stand and fall: Chassis-wise, we get d8 HD, 2 + Int skills per level and convey proficiency of themselves to their wielders. They have auras, all good saves and 3/4 BAB-progression. They also get their choice of either spontaneous arcane or divine spellcasting based on Charisma of up to 6th level, with spells drawn from either the sorceror/wizard or cleric spell-list and they may fulfill somatic components with weird movements. They also choose a school which then further defines the item, granting bonus spells over the levels as well as school powers at 2nd level and every even level thereafter. 5th level and every 5 levels thereafter allow for the taking of school powers from any school, not just the one chosen. They may eschew materials and absorb other magical items and their properties, effectively wielding them with concise and elegant rules. Living items increase their senses and natural AC over the levels and the capstone would be the attaining of a special purpose alongside one of 3 powerful abilities. If all of that does sound pretty nasty, then because it is – living items are pretty strong…but they have a HUGE Achilles heel: Anything that hampers magic can render them unconscious. Considering the widespread use of dispel magic etc., this actually rendered them manageable even in the context of grittier games. Now obviously, the school powers are on tantamount interest in a context where they pretty define the living item, as they can be pictured as pretty much revelation-like sequences of abilities which sometimes build upon one another. Abjuration specialists can e.g. learn to suppress items or store alternate slotted items for further use; conjuration items can come to the aid of bonded creatures or banish adversaries, heal their wielder…and even summon a wielder to them. Yeah, that can be really hilarious, also from a narrative point of view. “Okay, living item – you suppress your magic and hide among the weapon shipments to evil fortress of doom. Once in, you summon your wielder and we’ll crack open those gates.” That actually happened in my game. Spotting traps, forming a group connection, calming the bearer, controlling wielders, breaking the sanity of those in contact, faster flight, causing strange illusions…what about items that can animate the undead to wield them, that hex foes or store poison…or ones that can be healed (but also become susceptible to negative energy?) or mimic properties? Yeah, this engine provides a ridiculous amount of amazing customization options. The pdf also provides notes on how to create living items, how to use them as cohorts (they are awesome cohorts, but only available for mythic character per default) – the pdf is pretty extensive here. Wait, mythic? Yep, mythic living items are covered as well, providing full 10-tier progression notes for them…including 9th tier artifact apotheosis! Editing and formatting are top-notch, I noticed no hiccups. Layout adheres to Rogue Genius Games’ two-column full-color standard with a blend of new and stock art in both full color and b/w. The pdf comes fully bookmarked with nested bookmarks for your convenience. I pride myself after this many books on having a pretty precise radar when it comes to an author phoning in content. This is the antithesis. Stephen Rowe’s living items are so lovingly WEIRD, so magical and frankly ODD that I never expected to see a book like this, much less review it. More importantly, I never expected to find an engine this robust, this well-crafted. Now newsflash, rare magic games with few spellcasters and items may not need this; the magic item interaction and peculiarities assume pretty much a standard level of fantasy for PFRPG as a balancing guideline. D’UH. That being said, it is absolutely impressive to witness a concept this mechanically radical to actually succeed in presenting a balanced and diverse toolkit that basically can be summed up as a resounding success. It is the level of consideration for the small aspects, whether it is the minutiae of attribute-substitution or character generation, that make this stand out above and beyond its already impressively difficult design-goal. It is a true joy to report that Stephen Rowe delivers in spades. The engine depicted herein is exceedingly versatile and allows you to play anything – from the sage staff to the xenophobic chalice to the schizoid double sword. The level of abstraction and care required to create this framework is impressive; the attention to detail heart-warming and the narrative potential vast. Beyond its obvious oddity and novelty, reading this book made me come up with at least 10 kinds of plots wherein living items are culprits, masterminds or otherwise involved without even trying. In short: This is worth its asking price tenfold for all but the most gritty of low-magic games (seriously, not the target demographic for a book of talking, floating magic items – unless you want a really nasty villain the PCs never saw coming; for that purpose, this’ll do the trick in a particularly nasty and, dare I say, perfect manner in such a context!) and represents one of the most mechanically impressive feats the horsemen have crafted so far – 5 stars + seal of approval…and because I really dig how this enhances my games and how it can be used in pretty much any game in one capacity or another whether it’ll be NPC or PC, I’ll also nominate this creative supplement for my top ten of 2016. You can get this evocative, inspiring pdf here on OBS! This installment f the Tangible Taverns-series clocks in at 16 pages, 1 page front cover, 1 page editorial, 1 page foreword, 1 page advertisement/SRD, 1 page back cover, leaving us with 11 pages of content, so let’s take a look! A gorgeous white mansion caters to the ladies of good taste; it is frankly a fact that whomever has two X-chromosomes alongside a certain standing and pedigree should most certainly not be seen slumming in rowdy taverns. Instead, it would indeed be significantly more rewarding for such privileged ladies to visit the Delectable Dragonfly, a tea house of exquisitely good taste, where the gossip of the local elite and rich and powerful coalesces. And yes, dear ladies – there are delectable additions to add to the menu, which include massages…and everything else a discerning lady might wish for…particularly if her lord has certain…ahem…shortcomings. Prudes around there: You can put away the pitchforks, anything sexual herein is conveyed via innuendo and is absolutely PG. That being said, personally, I applaud this often neglected and stigmatized aspect of the facts of life. Run by Prim, a most charming hostess who was reimagined as a human in 5e and comes with full stats, this place is indeed a veritable oasis of delights – and information: The detailed rumors and events provided further emphasize this. Prim’s 5e-iteration is cool in that her luck-based tricks have been redesigned as several cool lair actions, which I most certainly loved. At the same time, her stats feature a glitch: She can lend a “point of inspiration” – which should probably be a die…and said die is not defined in her statblock either, making said ability not work as intended. The ruggedly handsome staff comes with well-drawn b/w-mugshots as well that could have been taken straight from a fantastic romance-novel, further underlining this theme. The fluffy write-ups themselves are flavorful: What about a halfling masseur with meticulously clean feet who can feel knots with them? Then, there would be the ruggedly handsome Vadim (with full stats) as well as his devotee/friend Sonia (similarly, with stats) and several regulars provided for a rich array of NPCs to interact with – including the local inquisitor (whose 5e-abilities explain with a unique weakness how she failed to put the pieces together), convinced that a brilliant serial killer is stalking the town. Well, guess what? She is right. She is also pretty much unwilling and incapable of believing the truth…unless it stares her right in the eye. Editing and formatting are top-notch, I noticed no significant hiccups apart from Prim’s guffaw. Layout adheres to a no-frills two-column b/w-standard. The b/w-artworks featured herein are all originals and well-made indeed. The cartography featured is rudimentary, but serves its purpose and the pdf comes fully bookmarked for our convenience. 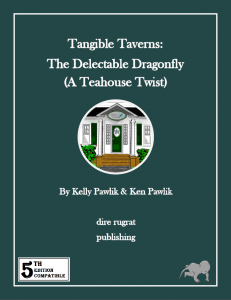 I really enjoyed Kelly & Ken Pawlik’s delectable dragonfly – and the 5e-version’s NPC-builds, with copious of unique abilities, rock in a similar manner as those featured among the PFRPG-iteration. While the glitch in Prim’s build is somewhat unpleasant, we do actually get the cool lair abilities, which somewhat mitigates this minor guffaw. In the end, I will hence settle on a final verdict of 5 stars, just short of my seal of approval. You can get this nice tea house here on OBS! This installment f the Tangible Taverns-series clocks in at 18 pages, 1 page front cover, 1 page editorial, 1 page foreword, 1 page advertisement, 2 pages of SRD, 1 page back cover, leaving us with 11 pages of content, so let’s take a look! And yes, dear ladies – there are delectable additions to add to the menu, which include massages…and everything else a discerning lady might wish for…particularly if her lord has certain…ahem…shortcomings. Prudes around there: You can put away the pitchforks, anything sexual herein is conveyed via innuendo and is absolutely PG. That being said, personally, I applaud this often neglected and stigmatized aspect of the facts of life. Run by Prim, a fetchling expert/luckbringer and most charming hostess, who comes with full stats, this place is indeed a veritable oasis of delights – and information: The detailed rumors and events provided further emphasize this. The ruggedly handsome staff comes with well-drawn b/w-mugshots as well that could have been taken straight from a fantastic romance-novel, further underlining this theme. The fluffy write-ups themselves are flavorful: What about a halfling masseur with meticulously clean feet who can feel knots with them? Then, there would be the ruggedly handsome investigator Vadim (with full stats) as well as his multiclassed devotee/friend Sonia (similarly, with stats) and several regulars provided for a rich array of NPCs to interact with – including the local inquisitor (again, with full stats and the truth-seeker archetype), convinced that a brilliant serial killer is stalking the town. Well, guess what? She is right. If some of the classes and classes features mentioned before just generated question marks above your head, rest assured that the pdf’s appendix will cover all relevant components – from the Sensuous Charm and Love’ Devotion feats to the complex truth inquisition and the relevant class features for the mistress’ luckbringer tricks. Editing and formatting are top-notch, I noticed no significant hiccups. Layout adheres to a no-frills two-column b/w-standard. The b/w-artworks featured herein are all originals and well-made indeed. The cartography featured is rudimentary, but serves its purpose and the pdf comes fully bookmarked for our convenience. 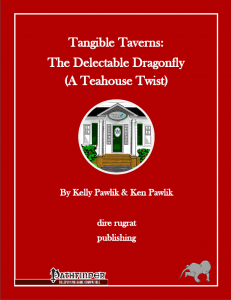 I really enjoyed Kelly & Ken Pawlik’s delectable dragonfly – it is a unique and flavorful establishment that represents a nice change of pace- a sanctuary of women, a place to enjoy gossip and the finer things in life, the tea house is evocative and flavorful. The NPC-builds are creative and varied and then adventuring potential conveyed via the rumors and events as well as the serial killer subplot, is extensive. There isn’t much more one can ask of such a nice humble pdf. 5 stars + seal of approval. You can get this fun, inexpensive little pdf here on OBS! This massive book clocks in at 206 pages, 1 page front cover, 1 page backer list, 1 page editorial, 1 page ToC, 1 page SRD, 3 pages of advertisement, 1 page back cover, leaving us with 197 pages of content, so let’s take a look! In 1876, the first time traveler managed to slip back 200 years back in time; this introduced ripples and other types of rifts to our world, bringing elves, halflings, etc. to our world as emissaries of magic. Ever since, the world has not been the same – Hypercorps 2099 is an allotopia, where time travel super soldiers and the like have influenced our history; where a dark elf assassin started WW I, where hippies discovered vancian casting and AI has developed – it is 2099 and the world is a radically different blend of cyberpunk aesthetics, fantasy and superhero aesthetics. The currency is bytecoins and, as a whole, it is interesting to note the highly unconventional theme of the setting: Unlike pretty much every cyberpunk game I know, Hypercorps 2099 feels less gritty, more light-hearted. To get a good idea of how it feels: Picture yourself as a child; you and your friends have just read Neuromancer for the first time, eaten a metric ton of sugar and discussed the ups and downs of various superhero comics and the LotR-movies; put these things in a blender and there you go. Alternatively, think of a less grim Shadowrun, with a massive sprinkling of M&M thrown into the mix. 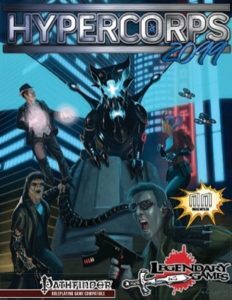 As has become the traditions with Mike Myler’s campaign settings, the book presented here falls on the high-concept end of things; Hypercorps 2099 does not concern itself with the minutiae of the particulars, instead focusing on the big picture of high concept adventuring. This focus also means that the advised gameplay does not begin at 1st level – instead, the book recommends starting with the 2nd or 3rd level and a hyper score of 1 (more on that aspect later); while gameplay before is possible, the engine of materials used herein makes it less the focus. This focus, for example, also is represented in the way in which the book focuses on the urban environment: The land between the sprawls is generally a corporate-owned place and due to easy transportation and virtual reality, there is considerable less need for traditional forms of contact. From this general perspective, we move fluidly into an example environment, namely what has become of Cleveland: From gangs to the never-ending tram to the hypermax penitentiary and the tainted waters of lake Erie and its water gangs (containing aquatic weirdness alongside wererats), we receive an interesting sketch for a campaign region to develop. This depiction, then, proceeds to introduce us to Murderball: Think of that as basketball with a non-bouncy ball and a goal…as well as the explicit goal of kicking your foe’s behinds and potentially, killing them. Players require a hand and no vehicles or explosives are allowed and there are quite a few different score fields, from deflector fields to those that have a tendency to phase out. It is quite nice to see the different score fields using different formulae to calculate their AC, though the actual gameplay rules for catching and intercepting are a bit simplistic, boiling down to relatively simple checks. What makes the game as a mini-game interesting would be the weird effects that the murderball stadium may feature – from neuralshocks to magic-impeding tricks, the effects per se are pretty nice, though purists may scoff at one of the precise wordings here; similarly, e.g. a hazard-level lightning effect sports no average damage value. These are not crucial hiccups, though this would be as well a place as any to comment on the depth of the setting material presented: If you’re like me and read the murderball-passage, you may very well smile at the idea; at the same time, though, the execution could have carries so much more: Unique fields, more and different balls, etc. – this is not intended as a disparaging comment, just as a n observation that the highlight-reel-style nature of the book does not have the space to develop all components to their full potential: Murderball as such could carry its own supplement and certainly can be developed by an enterprising GM into the primary focus of a whole campaign – but what’s here, ultimately, remains a basic framework. Whether you like that or not, ultimately remains up to your personal sensibilities. 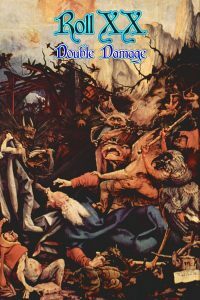 That being said, unlike in the 5e-version, the sanctioned items for different positions and high emphasis of PFRPG on item-choice, the game presented here actually works better than in the 5e-iteration and can, as a whole, be considered to be a more reliable experience due to the throwing rules employed here. That being said, with “Jarrikol”, an unbound AI and a quasi-devil/deity of the hypernet, various environments like e.g. Veranthea, Mike’s first campaign setting as a kind of game server, the hypernet remains a very dangerous, but also evocative and unique place that features some excellent ideas to scavenge and develop. The section also provides some nice traps/haunts that represent dangers of the hypernet their mechanical representation is significantly smoother than in the 5e-iteration. As before with murderball, we focus on the grand picture here, though the servers, somewhat like sub-planes, do have their own rules. Have I mentioned that the darknet is controlled by demons and devils? Yeah…tread carefully. After our trip to the technology side of things, the next section of the book deals with magical Kathmandu, where sacred creatures (CR +2) and dimension-hopping are part of the expected fare; street elementals roam the streets and the tunnels of sand can have truly unpleasant consequences. Similarly, the zodiac defenders, champions established and named after the signs, are mentioned. The alternate timeline provided for Latin America similarly is a detailed, varied section – where e.g. the saber of Bolivar is a powerful CL 20 artifact and both PMCs and continental threats loom. Yes, including the fourth reich. Beyond the confines of Latin America, the flying city of Lucrum, under the command of the hypercorporates, makes for a mobile flying fortress and quasi-autonomous zone; from the direct context of the brief history, one could picture this place as somewhat akin to MGS’ Outer Heaven under a corporate leadership, with a heavy dash of hypercapitalist Orwellianism. The deadly and powerful RAUs, the rapid assembly units, may make for feasible targets to deal with the threat…at least theoretically. If you are looking for more of a classic cyberpunk experience, you may want to look towards Neo York, where we receive rules for rogue automated vehicles as well as brief dossiers on how the old crime syndicates have reacted to the changed realities and options of 2099; corporate politics also congeal here, with a vast array of hypercorporations and their agents playing the grand game here. Wallachia has, in Hypercorps, become a force of its own, as Vlad himself has returned to claim his throne., creating a haven for the undead, with respective statutes governing daily life. The Blood Magic tradition, represented as 3 feats: Unlike the 1 5e-feat, these 3 provide a complex and precise take on the concept of blood-powered metamagic that also prevents abuse. Kudos! But let’s move on to organizations, from anonymous to the church of cthulhu, derklitz, a synthpop-celebrity worshipped as divine, to the hypercorporations (including necromanagement, known for undead slave labor), the respective brief entries are nice, though one, Xypher Media Institute, is oddly missing the alignment note. After this, we dive into the critters/NPCs…which are BUTAL regarding both damage output and defenses; DM-1, for example, has a nasty mechwarrior suit; the dog-faced Sergeant K-9 (groan-worthy pun worthy of yours truly there -well-played), powerful Rabbit, Deadpool lookalike Big Cheez, super-ganger Deathslide…there are a lot of unique champions herein on both sides of the spectrum; Aurora, infused with positive energy and sworn to hunt down Vlad Dracul (CR 33), for example…or what about BioSpecs CEO, who may be under the influence of the suit she created. Archangel stand-ins like Deathwing, former Cthulhu-cultists turned hero, Edgar Allen Poe (a very powerful psychic, obviously), an elven temple champion that looks like an angel, a good undead gunslinger…oh, and the author has played the first season of the gloriously insane Sam & Max Telltale games – Roy G. Biv can be found reincarnated as King Lunar here. A bear-anthro called Kodyax may be a nice nod towards the member of the roleplaying community, the less-known superhero…or something else. Devil-blooded legendary netjackers, the legendary invisible assassin Nevidimy, the Native American spin on Captain America and the construct S.H.E.R.L.O.C.K. with the superb agent of the highest rank…well, you get the idea. The dramatis personae herein could be taken from the pages of golden and silver age comic books, a theme further underscored by them having their own fonts/logos for their names. And nope, I have not covered all of them. The hyper bestiary begins with 5 templates (CR +1 to +2) to enhance creatures encountered before providing the stats for genetically engineered 4th Reich soldiers, the gigantic dakai, various drones, hyper lycanthropes/vampires, the nigh unstoppable Kawsay Sach’aqa plant monster (CR 27), robo T-Rex and dragons…there are quite a few of interesting critters here. All right, so by now you’ll have an idea how the setting feels and works regarding its aesthetics and motifs, so let’s get into the nit and grit: Athletics collates Swim and Climb, while Perception is replaced by Awareness. Search is used instead of Perception to find secret doors etc. and there also is Knowledge (technology) and Use Technology. Vehicular Control is based on Dex. All skills come with notes for which classes they are available and, if required, sample DC-tables. Whether you like the split of Perception remains a matter of taste. The higher power of both PCs and adversaries means that the game as presented here, ultimately is more lethal and the book does provides notes on how to handle this. Both XP-progression and the use of hero points are strongly encouraged and GMs can look forward to skyscrapers used as dungeons (see the recent, horribly underappreciated Judge Dredd movie for inspiration there!) and there also are several security systems depicted. Unlike the 5e-version, which oddly put the attributes in the back, this one’s organization is a bit better, following the basic skill-collation up with info of aforementioned new attributes: The book also introduces two new attributes, namely luck and reputation. Luck is 10 + 2 x hyper score; Reputation is 10 + 2 x hyper score + Charisma modifier. PCs get contacts equal to the reputation modifier. These scores, however, have hard limits: PCs can only use luck equal to the attribute modifier times per day and reputation only once per modifier per week and they need to request those checks. While seemingly odd, this little operation can actually be pretty helpful for creative games that feature an experienced GM. While testing this, a player invoking luck had e.g. an elevator containing a hostile team stuck for precious few rounds to make an escape. A group shares one wealth score, which is equal to all luck and reputation scores added together, divided by the number of characters. The pdf does provide an easy formula for covering one’s tracks. GMs also receive various security systems. The GM-section similarly sports one-page templates for steam-punky pseudo-Victorian gameplay, WW-era and the contemporary age – while these are appreciated, I think that full-blown books for them would have probably been the wiser choice here; at basically one template each and a couple basic pieces of information, they don’t cover the basics. That being said, the book does feature several archetypes to fit within the context of the game: The Ballistics Brawler monk archetype, who gains flurry with guns and may use ki instead of grit at -3 levels, the Cyber Ninja, who gets less sneak progression, but drones (Heja MGS! ), the Cyber Samurai samurai archetype, who gets cybertech instead of mounts and features the order of the street. Netjackers may elect to become mechwarriors – which basically completely rewire a large part of said new class. The netjacker The netjacker base class receives d6, 2+Int skills per level, 3/4 BAB-progression, good Ref and Will-saves and proficiency with simple weapons and one exotic weapon of their choice. They also are proficient with light and medium armors and 1st level netjacker begin play with an installed hyperjack and digiboard. Netjackers are all about controlling robots – when in combat while controlling robots, they take a -3 penalty to AC, which is reduced by 1 at 6th level and every 6 levels thereafter. At the beginning of a day, a netjacker chooses either a proxy or drones, both of which are collectively known as robots. Robots progress with a 3/4 BAB-progression, d10, 6+Int skills per HD, only bad saves, AC-bonuses that scale from +0 to +16, Str/Dex-bonuses that scale up to +6 and scaling upgrade pools and bonus HP for proxies and drones. Proxy upgrade pools scale up from 3 to 26, bonus hp from 2 to 46. Upgrade pools for drones scale up from 1 to 9 and bonus hp from 1 to 24. Proxies act upon your initiative -3, drones at initiative -6. Sharing senses can be accomplished as a standard action -proxies can furthermore act as if properly possessed. Drones, obviously, as less powerful robots, can instead offer more than one active at any given time- 1st level netjacker can have 2 active, +1 at 8th and 16th level and possess these drones as well Netjacker receives scaling bonuses to Technology-related skills and at 2nd level and every 2 levels thereafter, the netjacker receives a hacking talent. Some sample proxie base forms (3) and two sample drone base forms (2) are provided. These talents allow for the sabotage of armor, equipment, etc. – personally, I’m not a big fan opposed level checks used – especially since the wording could be read as a fixed value or as an opposing roll – not sure which it is: “The netjacker makes a Use Technology check opposed by a level check (her target’s hit dice +1 per 2000bt of the item’s value).” – Granted, this is a minor glitch and more a matter of taste, so no biggie. Better hoverboarding, becoming invisible to tech – some nice options. At higher levels, coordinated attacks allow the netjacker to expend actions of robots to grant himself a hyper bonus and further scaling hyper bonuses are interesting. 10th level expands the list of available talents to provide advanced talents, 17th level nets +1 standard action in the hypernet and at the capstone, the class gets dual initiative a limited amount of times per day- once in the hypernet, once in the real world. The Veloces, chassis-wise, does look a bit like a bland monk-reskin at first sight; however, unlike in the pretty disappointing 5e-iteration, the class can stand on its own: Basically, it is a take on the Flash, Quicksilver and similar speedster characters. Yes, if you’re fast enough, you’ll run on walls, punch foes with incredible potency, etc. Self-haste and similar tricks help make this variant a fun addition to the roster, with a ton of talent-customizations and proper player agenda. A crucial component of any cyberpunk game lies in the customization of pretty much everything cybertech related, gun-or similar equipment-related. Opposed to the 5e-version, the engine allows for several unique tweaks: Including DR-granting armor, a significant array of firearms that feature takes on automatic and semi-automatic fire. They, unsurprisingly, also deal serious damage. Autofire generates lines of fire, semi auto guns allow for Rapid Reload like shots. The pdf also features proper stats for various vehicles, including hoverboards. While smoother executed than the 5e-iteration, this may be the one aspect where I sincerely feel that this book falls short of its own ambition – perhaps I’m spoiled by years of Cyberpunk 2020 and Shadowrun, but equipment-wise, Hypercorps 2099 simply doesn’t have that much to offer – the modifications are nice, but nowhere near fulfill the needs of my group. Now, so far, the most crucial rules-difference has not yet been covered – that would be going hyper, becoming basically a superhero. This is represented by gaining a hyper score. Hyper score allow you to gain access to hyper bonuses, which stack with every bonus, even other hyper bonuses. They do not, however, allow you to stack two identical effects. The hyper score is a 10-level progression, somewhat akin to mythic tiers and hyper bonus scales up to +5 over this progression. Hyper score also determines the maximum amount of hero points you can hold and provides up to 5 hyper feats, but also 2 hyper flaws over its progression. Hyper bonuses thus gained pretty much apply to almost anything and thus, the table features a handy CR-increase for your convenience. Oh, the table also nets you more hit points and ability score increases. Hero points work in different, more potent ways for hyper characters, allowing for brief scene-control, for example. Hyper characters also gain more attacks, heal quicker, grant themselves a kind of advantage or benefit, a limited number of times from FF’s Life III, becoming very hard to kill. A lot of customization options happen via the respective hyper feats, which allow you to scavenge progressively better monster qualities, implant more cybertech, (de-)activate technological devices at range, etc. Better planar adaption to magic within the unreliable hypernet, a proper secret identity (into which you can change at Superman-in-phone-booth-speed) or hyper vehicles – the selections provided here are versatile and fun. Hyper flaws would be the unique Achilles heels you’d associate with superheroes and villains – from requiring an object to tiring exertions, these flaws represent a fun, identity-constituting element. Beyond the basic hyper score and its consequences, the pdf assumes a type of 5 different hyper routes: The Abbernaut is basically the guy that receives monstrous abilities; the meganaut is the regular super who enhances hyper attributes; the hypernaut is the guy who gains the hyper powers; the parallel is the gestalt-spellcaster and the savant is the non-magical gestalt who gains more non-magical tricks; depending on the route chosen, you gain different arrays of hyper flaws. Hyper powers are grouped by 3 tiers and their general rules are presented in a concise and easy to grasp manner; some may be taken multiple times and they do NOT screw around. What about time stop for two rounds or any villain’s favorite gambit, cloned simulacra? Talking to the city (breaks into “The Spirit”-impression) or fabulous wealth…some seriously cool stuff here. Now I mentioned hyper attribute traits – these would basically be abilities grouped by attribute which allow you to perform those heroic acts: Ignoring conditions, throwing huge things, being ridiculously likable, auto-skill check successes…basically, these would be the tricks that make you more of an incarnation of the things you’d do with the respective attributes. Editing and formatting are pretty good; while I noticed a couple of minor hiccups here and there, as a whole, the book is very readable and the majority of the rules language is similarly precise. The most prominent glitches are minor typesetting hiccups. Layout adheres to a two-column full-color standard and manages to cram a TON of text into the pages of this book, making it look somewhat busy, but also getting you maximum bang for your buck per page. The pdf sports a ton of artwork, which ranges from often used stock to original pieces; most of them adhere to the comic-style flair that fits well with the theme, even though personally, I’m not the biggest fan of the style, I appreciate the very high art-density of the book. The pdf comes fully bookmarked for your convenience. Mike Myler, Savannah Broadway, Luis Loza and Michael McCarthy deliver a book that deserves being called unique; I have literally never before seen a take on cyberpunk that emphasizes the at times cheesy superhero-esque components that e.g. high-powered Shadowrun etc. tend to feature. The flavor of the setting is unique and it has this gleeful over-the-topness that makes you smile – we don’t get sharks with lasers, we get dragons with lasers. This would perhaps be the best way to look at this toolkit/campaign setting. If you expect copious information on the minutiae of daily life, an exploration of social dynamics and the more subdued aspects of cyberpunk, including what “humanity” means…then this is probably not for you. If you, however, want to blow up skyscrapers, crash-land flying cities into legions of genetically-engineered nazi-drones or test your superhuman strength against a ginormous plant-monstrosity with your pal Edgar Allen Poe riding a hoverboard…then this will be just what the doctor ordered. This setting polarizes. Chances are that you already know whether this is for you or not at this point. To state this loud and clearly: The PFRPG-iteration of the book is better than its 5e-version; we get more artistry; variant classes instead of short archetypes, a more pronounced compatibility with established material, etc. Even the structure of how rules are presented is more concise in the PFRPG-version. Anyways, like the 5e-version, players who expect a ton of customization and tweaking options will be disappointed to see the scope of both equipment and cybertech; the chapters do their basic job, but not much beyond that. On the plus-side, the PFRPG hyper-score rules are more elegant and versatile and allow for more options and their rules are presented in a pretty simple and easy to grasp manner; the escalation of deadliness of both PCs and adversaries generates an interesting playing experience. The hyper routes cover the vast majority of common superhero tropes in a basic system that you can learn within 5 minutes…and while you get the basics, I really hoped to see more powers here…though access to SPs of PFRPGs vast array of spells means that you’ll have more options with this iteration. In short: The hyper score engine could have used expansions. On the other side, it does already allow for an impressive array of modifications and options. Pretty much every aspect of this book can be seen as either a feature of as a bug; I frankly could wax poetically about the sheer density of amazing over the top action for pages on end…or, I could complain for the same length about aspects that could have used further fleshing out, in both mechanical engines and environments. Ultimately, to me at least, this book feels a bit like it tries to do a bit too much at once; a focus on either campaign setting or cyberpunk/superhero-rules would have allowed the campaign setting, which is pretty intriguing, more space to shine and provide enough room for the equipment and super-aspects to grow. To my own sensibilities, the compromise of packing both into one book ended up making them both good, no doubt about that…but also made them fall short of their own, significant potential. Less so than in the 5e-version…but still. The short non-2099-era sketches of e.g. the WW-age in the GM-section would be the culmination of this aspect of the book: Well-intentioned though they are, they are too short to be of significant use to pretty much anyone. The aspects where I definitely cannot complain in any way would be the powerful NPCs and the creatures: Exceedingly powerful, these beings unanimously have this glorious sense of irreverent humor, this sense of anything goes. Extra brownie points if you get why Poe needs to eat a pomegranate every day to retain his powers, for example. 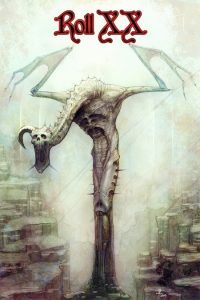 These are also the aspect of the book where, no matter how you look at it, it delivers: Bosses with SERIOUS staying power abound, in spite of the increased power-level – so if you’re looking for epic boss fights and a somewhat video-gamey-sensibility to accompany the flavor, well, here are foes that can take the punishment. The adversaries in the book are very, very nasty; Vlad-y boy will wreck you. Even among the unnamed NPCs like security officers etc., you will not find entries with low hit points. These NPCs and creatures also represent perhaps the best litmus-test on whether you’d like this: If you can smile at Sergeant K-9 or at some of the other beings here, then chances are you’ll find a place in your heart for this book. If the gritty day to day survival aspect of cyberpunk and the transhumanist questions are what brought you to the genre, you will probably be less excited about what you find herein. In short: This may not deliver in grit or detail, but it represents a delightfully gonzo, over the top experience. It is more superhero with a cyberpunk aesthetic, not vice versa. It is very hard for me to rate this; as a reviewer, I can complain about the few formal hiccups I noticed – but as a whole, the PFRPG-version is better. Apart from that as a formal complaint, the vast majority of gripes I could potentially field can be mitigated by simply stating that the intent of the book, the focus, is different. The more action-oriented among my players really liked testing this; the detail-oriented planners were significantly less taken and impressed…which also eliminates this means of determining a rating for this book. Personally, I am torn to an extent beyond what most books manage to elicit – I adore several aspects and the vast imagination, but also bemoan the scope of the equipment aspects and power-options, both of which combined could probably fill a book of this size on their own regarding the amount of material you could make for them. On the one hand, I could argue for a 4 star rating; sober me complaining about the hiccups, the fact that the book’s all over the place and that almost all aspects could have used more coverage. On the other hand, though, I could also start gushing and rambling about the awesome concepts, the glorious critters and the sheer glee that oozes from these concepts and proclaim this a 5-star masterpiece with a uniquely fun and gonzo aesthetic. Additionally, the PFRPG version provides a bit more care, feels a bit more streamlined and routed in the aesthetics of the system than the 5e-iteration. The truth for you, my readers, will quite probably fall on either one of these two ratings; either you’ll really like it and disregard what could be construed as shortcomings or the shortcomings weigh more heavily for you than the boons this offers. As a reviewer, I can understand both positions and thus urge you to select yours. I, however, cannot rate this as both and thus will settle on a final verdict in the middle, at 4.5 stars, rounded up to 5 due to in dubio pro reo. If you have the luxury of choosing your system, I’d suggest the PFRPG iteration. You can get this massive setting/toolkit-book here on OBS! This massive campaign setting/toolkit clocks in at 190 pages, 1 page front cover, 1 page backer thanks, 1 page editorial, 1 page ToC, 1 page SRD, 4 pages of advertisement, leaving us with 181 pages of content, so let’s take a look! This focus, for example, also is represented in the way in which the book focuses on the urban environment: The land between the sprawls is generally a corporate-owned place and due to easy transportation and virtual reality, there is considerable less need for traditional forms of contact. From this general perspective, we move fluidly into an example environment, namely what has become of Cleveland: From gangs to the never-ending tram to the hypermax penitentiary and the tainted waters of lake Erie and its water gangs (containing kuo-toa alongside wererats), we receive an interesting sketch for a campaign region to develop. This depiction, then, proceeds to introduce us to Murderball: Think of that as basketball with a non-bouncy ball and a goal…as well as the explicit goal of kicking your foe’s behinds and potentially, killing them. Players require a hand and no vehicles or explosives are allowed and there are quite a few different score fields, from deflector fields to those that have a tendency to phase out. It is quite nice to see the different score fields using different formulae to calculate their AC, though the actual gameplay rules for catching and intercepting are a bit simplistic, boiling down to Strength (athletics)-checks. What makes the game as a mini-game interesting would be the weird effects that the murderball stadium may feature – from neuralshocks to magic-impeding tricks, the effects per se are pretty nice, though purists may scoff at one of the precise wordings here; similarly, e.g. a hazard-level lightning effect sports no average damage value. These are not crucial hiccups, though this would be as well a place as any to comment on the depth of the setting material presented: If you’re like me and read the murderball-passage, you may very well smile at the idea; at the same time, though, the execution could have carries so much more: Unique fields, more and different skill uses, etc. – this is not intended as a disparaging comment, just as a n observation that the highlight-reel-style nature of the book does not have the space to develop all components to their full potential: Murderball as such could carry its own supplement and certainly can be developed by an enterprising GM into the primary focus of a whole campaign – but what’s here, ultimately, remains a basic framework. Whether you like that or not, ultimately remains up to your personal sensibilities. Pretty much every cyberpunk game has its take on virtual reality and the same holds true for the hypernet that the year 2099 features: Creatures entering the place generally can do so via a variety of means; the place, as a whole, is presented pretty much as a plane, with highly morphic properties and several unique aspects. An important component that accompanies this would be the fact that you use your mental attributes instead of physical ones when in the hypernet – which obviously means that the big, bad bullies will probably be pretty weak around here. While time-honored mechanics-wise (the same mechanics have been used since the days of old for the realm of dreams or similar excursions), this also means that fighters and similarly physical characters won’t have that much fun in the hypernet. It also makes spellcasting unreliable, unless you have the Scientific Wizardry feat, which, among other things, makes your spells bypass resistances and immunities of the spells of anyone who does not have this feat…which is a pretty OP thing that imposes a further feat-tax on defensive/buff casters, which, considering 5e’s prevalence of concentration-durations and less intricate stacking mechanics, isn’t necessarily something I think that the engine needed. Purists of 5e may also notice that the traps for the hypernet do feature attribute damage, something pretty rare in 5e, and wording-wise a component phrased slightly differently – personally, I don’t object to these components, being used to them, but it is still something to bear in mind if you are particularly purist in your sensibilities. That being said, with “Jarrikol”, an unbound AI and a quasi-devil/deity of the hypernet, various environments and e.g. Veranthea, Mike’s first campaign setting as a kind of game server, the hypernet still remains a very evocative and unique place that features some excellent ideas to scavenge and develop; as before with murderball, we focus on the grand picture here, though the servers, somewhat like sub-planes, do have their own rules. After our trip to the technology side of things, the next section of the book deals with magical Kathmandu, where sacred creatures and dimension-hopping are part of the expected fare; street elementals roam the streets and the tunnels of sand can have truly unpleasant consequences. Similarly, the zodiac defenders, champions established and named after the signs, are mentioned. The alternate timeline provided for Latin America similarly is a detailed, varied section – where e.g. the saber of Bolivar is a legendary item, ready to be wielded by those pure of heart, and both PMCs and continental threats loom. Yes, including the fourth reich. If you are looking for more of a classic cyberpunk experience, you may want to look towards Neo York, where we receive rules for rogue automated vehicles as well as brief dossiers on how the old crime syndicates have reacted to the changed realities and options of 2099; corporate politics also congeal here, with a vast array of hypercorporations and their agents playing the grand game here. Wallachia has, in Hypercorps, become a force of its own, as Vlad himself has returned to claim his throne., creating a haven for the undead, with respective statutes governing daily life. The Blood Magic tradition, represented as a feat found herein can be taken as one of the crunchy tidbits suffusing the book that is evocative, but could use some increased precision: It allows you to increase spell levels by inflicting damage to yourself. Does this require a Constitution save? While the maximum increase is capped by both proficiency bonus and exhaustion gained, RAW the feat may be read as to allow for the casting of spells increased beyond one’s theoretical knowledge. After this, we dive into the critters/NPCs…which are BUTAL regarding both damage output and defenses, though there also are some odd aspects: DM-1, for example, is vulnerable to critical hits; dog-faced Sergeant K-9 (groan-worthy pun worthy of yours truly there -well-played), powerful Rabbit, Deadpool lookalike Big Cheez, super-ganger Deathslide…there are a lot of unique champions herein on both sides of the spectrum; Aurora, infused with positive energy and sworn to hunt down Vlad Dracul, for example…or what about BioSpecs CEO, who may be under the influence of the suit she created. Archangel stand-ins like Deathwing, former Cthulhu-cultists turned hero, Edgar Allen Poe, an artificial angel, a good undead gunslinger…oh, and the author has played the first season of the gloriously insane Sam & Max Telltale games – Roy G. Biv can be found reincarnated as King Lunar here. A bear-anthro called Kodyax may be a nice nod towards the member of the roleplaying community, the less-known superhero…or something else. Devil-blooded legendary netjackers, the legendary invisible assassin Nevidimy, the Native American spin on Captain America and the construct S.H.E.R.L.O.C.K. with the superb agent of the highest rank…well, you get the idea. The dramatis personae herein could be taken from the pages of golden and silver age comic books, a theme further underscored by them having their own fonts/logos for their names. And nope, I have not covered all of them. The hyper bestiary begins with 6 templates to enhance creatures encountered before providing the stats for genetically engineered 4th Reich soldiers, the gigantic dakai, drones, hyper lycanthropes/vampires, the nigh unstoppable Kawsay Sach’aqa plant monster, robo T-Rex and dragons…there are quite a few of interesting critters here. All right, so by now you’ll have an idea how the setting feels and works regarding its aesthetics and motifs, so let’s get into the nit and grit: The book introduces two new skills, both of which are based on Intelligence, these being Law and Technology. 6 new kits represent the respective tools for hyper gameplay. The high-strung super-hero-esque stories at the center of hypercorps assume for the chance of success in even relatively strange circumstances and allow for collective checks that allow for the addition of their bonuses; as such, team maneuvers can be significantly higher, DC-wise. The higher power of both PCs and adversaries means that the game as presented here, ultimately is more lethal and the book does provides notes on how to handle this. Both XP-progression and the use of hero points (see DMG) are strongly encouraged and GMs can look forward to skyscrapers used as dungeons (see the recent, horribly underappreciated Judge Dredd movie for inspiration there!) and there also are several security systems depicted. The GM-section similarly sports one-page templates for steam-punky pseudo-Victorian gameplay, WW-era, contemporary age – while these are appreciated, I think that full-blown books for them would have probably been the wiser choice here; at basically one template each and a couple basic pieces of information, they don’t cover the basics. That being said, the book does feature several archetypes to fit within the context of the game: The Ballistics Brawler monk tradition, the Cyber Ninja Rogue (Heja MGS! ), the Cyber Samurai martial archetype, the mechwarrior sorcerous origin – these pretty much are self-explanatory representations of their respective tropes. The netjacker rogue archetype would be basically the combo rigger/decker and the veloces is basically a speed-themed monk. These, while generally good renditions of the core aspects of the respective roles, ultimately felt a bit less inspired to me – the Netjacker, in PFRPG its own class, is only a vanilla rogue until 3rd level, which can be pretty disheartening, for example. I think that more than one of these options could have carried its own alternate class. We also receive 5 backgrounds, though these lack goals, etc. – they only cover the proficiencies and features as well as a random aspect. A crucial component of any cyberpunk game lies in the customization of pretty much everything cybertech related, gun-or similar equipment-related. Weapons and armor come with 4 upgrades each and we get 11 cybertech enhancements as well as some serious equipment – with hoverboards, C4 and all in between, including drugs, covered. Firearms require a bonus action to aim to add the proficiency bonus to atk and otherwise act as crossbows for feat-etc. purposes. They also deal serious damage. Autofire guns can instead use the bonus action to fire a second shot at disadvantage, while bullet sprayers may target cubes; damage-type switchers and stun-guns…the rules are pretty concise and yes, vessels are also featured. 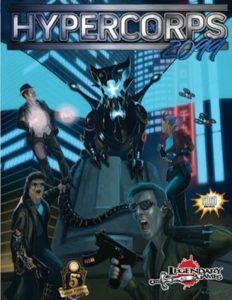 Still, this may be the one aspect where I sincerely feel that this book falls short of its own ambition – perhaps I’m spoiled by years of Cyberpunk 2020 and Shadowrun, but equipment-wise, Hypercorps 2099 simply doesn’t have that much to offer. As a minor nitpick, RAW, the ammo can be scavenged after firing guns, which makes no sense. Now, so far, the most crucial rules-difference has not yet been covered – that would be going hyper, becoming basically a superhero. This is represented by gaining a hyper score and an associated template; if you’re a veteran, think of that as a gestalt; if you’re new to the subject matter, think of it as getting more bonuses – a total of 3 feats, up to +5 proficiency and hero points – the hyper score determines the total of hero points you can have at any given time. From an aesthetic point of view, the table has a type-setting glitch that should have been caught. Hero points are more potent in the game, allowing for example for a roll to be treated as a natural 20. The hyperscore also allows for ability score increases beyond 20, add attacks, gain more hit dice as well as better initiative. To work in conjunction with the super hero theme, going hyper may also entail gaining one serious hyper flaw – from weaknesses to addictions and the like. Hyper feats allow you to gain monster qualities, hyper items, better cybertech…you get the idea. These hyper feats (and attribute traits) are generally grouped in 4 routes of being hyper: The Abbernaut is basically the guy that receives monstrous abilities; the meganaut is the regular super; the parallel is the gestalt-spellcaster and the savant is the non-magical gestalt who gains more non-magical tricks; depending on the route chosen, you gain different arrays of hyper flaws. Now I mentioned hyper abilities; you can choose up to ability modifier such traits for a given attribute – a character with Dexterity 18 could have, for example, up to 4 of these with the right hyper route. These allow you to add bonus damage to attack, provide advantage on associated saves, provide sage advice as a reaction – but generally, they allow for the more efficient use of the respective engine; think of these as enhancers; you get more reliably good at using the attribute in question. In short: The book advances this aspect in depth, not in breadth. The book also introduces two new attributes, namely luck and reputation. Luck is 10 + 2 x hyper score; Reputation is 10 + 2 x hyper score + Charisma modifier. PCs get contacts equal to the reputation modifier. These scores, however, have hard limits: PCs can only use luck equal to the attribute modifier times per day and reputation only once per modifier per week and they need to request those checks. While seemingly odd, this little operation can actually be pretty helpful for creative games that feature an experienced GM. While testing this, a player invoking luck had e.g. an elevator containing a hostile team stuck for precious few rounds to make an escape. A group shares one wealth score, which is equal to all luck and reputation scores added together, divided by the number of characters. When trying to get temporary goods and the like (most of which are illicit, obviously), the GM can roll 1d20 + wealth ability modifier; the result times 100 bytecoins is the cap; said sudden influx of non-permanent equipment, obviously vanishes again. This is a simple abstraction, but one that streamlines getting gear and arguing over who pays for what. Mike Myler and Rich Howard deliver a book that deserves being called unique; I have literally never before seen a take on cyberpunk that emphasizes the at times cheesy superhero-esque components that e.g. high-powered Shadowrun etc. tend to feature. The flavor of the setting is unique and it has this gleeful over-the-topness that makes you smile – we don’t get sharks with lasers, we get dragons with lasers. This would perhaps be the best way to look at this toolkit/campaign setting. If you expect copious information on the minutiae of daily life, an exploration of social dynamics and the more subdued aspects of cyberpunk, including what “humanity” means…then this is probably not for you. If you, however, want to blow up skyscrapers, crash-land flying cities into legions of genetically-engineered nazi-drones or test your superhuman strength against a ginormous plant-monstrosity with your pal Edgar Allen Poe riding a hoverboard…then this will be just what the doctor ordered. This setting polarizes. Chances are that you already know whether this is for you or not at this point. Still, to reiterate the strengths and weaknesses of this book: On the downside, we have a few minor instances of imprecision here and there and the organization; hyper scores and pretty much all relevant game-play mechanics in the end and the sequence of their presentation make the rules-chapters in the end feel a bit less easy to grasp than they could be; Usually, you begin at the bottom, with abilities and here, hyperscores, and then move into the particulars. Anyways, apart from this didactic gripe, players who expect a ton of customization and tweaking options will be disappointed to see the scope of both equipment and cybertech; the chapters do their basic job, but not much beyond that. On the plus-side, the rules presented are pretty simple and easy to grasp; the escalation of deadliness of both PCs and adversaries generates an interesting playing experience, with e.g. damage threshold rules being applied to some critters etc. The hyper routes cover the vast majority of common superhero tropes in a basic system that you can learn within 5 minutes…but they also, once again, are just that – the basics. If you wanted to play Magneto, for example, you’ll strike out. In short: The hyper score engine, while solid, could have used expansions. On the other side, it does already allow for an impressive array of modifications and options. In short, pretty much every aspect of this book can be seen as either a feature of as a bug; I frankly could wax poetically about the sheer density of amazing over the top actions for pages on end…or, I could complain for the same length about aspects that could have used further fleshing out, in both mechanical engines and environments. Ultimately, to me at least, this book feels a bit like it tries to do a bit too much at once; a focus on either campaign setting or cyberpunk/superhero-rules would have allowed the campaign setting, which is pretty intriguing, more space to shine and provided enough room for the equipment and super-aspects to grow. To my own sensibilities, the compromise of packing both into one book ended up making them both good, no doubt about that…but also made them fall short of their own potential. The short non-2099-era sketches of e.g. the WW-age in the GM-section would be the culmination of this aspect of the book: Well-intentioned though they are, they are too short to be of significant use to pretty much anyone. The aspects where I definitely cannot complain in any way would be the powerful NPCs and the creatures: Exceedingly powerful, these beings unanimously have this glorious sense of irreverent humor, this sense of anything goes. Extra brownie points if you get why Poe needs to eat a pomegranate every day to retain his powers, for example. These are also the aspect of the book where, no matter how you look at it, it delivers: Bosses with SERIOUS staying power abound, in spite of the increased power-level – so if you’re looking for epic boss fights and a somewhat video-gamey-sensibility to accompany the flavor, well, here are foes that can take the punishment. You will find precious few of the legendary NPCs featured with less than 100 hp; Vlad-y boy actually has more than 400. Even among the unnamed NPCs like security officers etc., you will not find an entry below 30 hit points. These NPCs and creatures also represent perhaps the best litmus-test on whether you’d like this: If you can smile at Sergeant K-9 or at some of the other beings here, then chances are you’ll find a place in your heart for this book. If the gritty day to day survival aspect of cyberpunk and the transhumanist questions are what brought you to the genre, you will probably be less excited about what you find herein. In short: This may not deliver in grit or detail, but it represents a delightfully gonzo, over the top experience. It is very hard for me to rate this; as a reviewer, I can complain about the few formal hiccups I noticed (“proficiency modifier” instead of “proficiency bonus”, nonstandard sequence of that in save-DC lists) – but they tend to, for the most part, not reach the levels where they’d negatively influence rules. Apart from that as a formal complaint, the vast majority of gripes I could potentially field can be mitigated by simply stating that the intent of the book, the focus, is different. The more action-oriented among my players really liked testing this; the detail-oriented planners were significantly less taken and impressed…which also eliminates this means of determining a rating for this book. Personally, I am torn to an extent beyond what most books manage to elicit – I adore several aspects and the vast imagination, but also bemoan the scope of the equipment aspects and power-options, both of which combined could probably fill a book of this size on their own regarding the amount of material you could make for them. On the one hand, I could argue for a 3 star rating; sober me complaining about the hiccups, the fact that the book’s all over the place and that almost all aspects could have used more coverage. On the other hand, though, I could also start gushing and rambling about the awesome concepts, the glorious critters and the sheer glee that oozes from these concepts and proclaim this a 5-star masterpiece with a uniquely fun and gonzo aesthetic. The truth for you, my readers, will quite probably fall on either one of these two ratings; either you’ll really like it and disregard what could be construed as shortcomings or the shortcomings weigh more heavily for you than the boons this offers. As a reviewer, I can understand both positions and thus urge you to select yours. I, however, cannot rate this as both and thus will settle on a final verdict in the middle, at 3.5 stars, rounded up to 4 due to in dubio pro reo. If you have the luxury of choosing your system, I’d suggest the PFRPG iteration.